The intranet is an important place at work where employees can obtain information. There are a number of concepts from the previous topics on wikis and social networking that can be used to design a better intranet. A good intranet design will for example, incorporate features such as a smart user profile and RSS feeds. There are a number of design and social barriers to a good intranet such as having a confusing user interface and a lack of management support. These barriers can be minimised and reduced by having clear goals and support from management and employees for a better intranet. A company's intranet is a repository of information. For a large corporation such as Vodafone with thousands of employees, the company intranet remains an important tool to release information. As information technology improves however, intranets must also evolve and change to incorporate new technology. A number of improvements for the intranet can be suggested based off previous topics about the latest developments on the internet. Information should be coming to you rather than you having to find information. Vodafone was in the 2006 Top 10 Best Intranets by the Nielson Norman group. 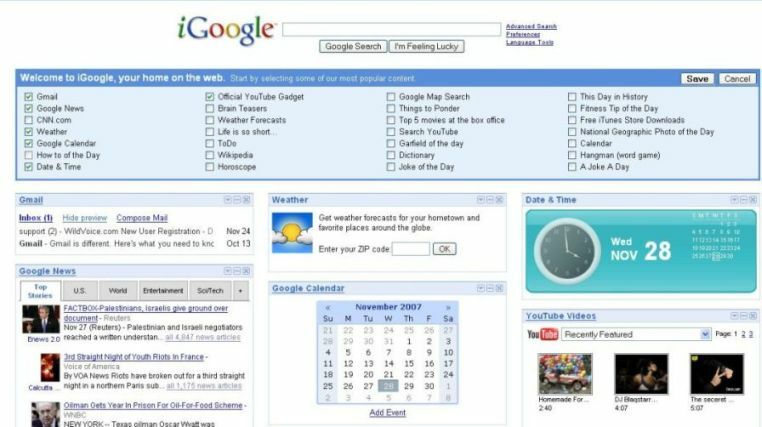 However, it wasn't it in the 2007 Top 10 Best Intranets. Looking at 2007's characteristics, a number of these such as wikis and RSS were covered in the previous internet explorer topics. Vodafone should take note of these additions and improve its intranet so it can win an award in 2008! Dynamic - A comprehensive paper on business intranets. Step Two - On Keeping a healthy intranet. Function Rich - On the benefits of an intranet. HCi - On common problems with an intranet. To design a more efficient way of business intranet, a number of key concepts from the previous topics can be used to provide more efficient communications in a large corporation's intranet such as Vodafone. Taking into account the above, what should an excellent intranet hold? Currently all Vodafone employees already have an computer identity that provides them access to the company intranet and programs. This is sufficient for most daily usage. This is a very passive process however and users can not contribute to the intranet or customise their profile. Everyone sees the exact same tools and pages. Very often, there are more options than necessary and users have to search through the various options to select tools relevant to their job. If we are to consider the intranet a tool to increase efficiency then customisation of the intranet becomes a good way to do so. A smart user profile similar to a Myspace or Facebook profile will go a long way in providing employees a sense of control over the otherwise large amount of information on the intranet. By controlling what and where information appears on the main intranet page, employees can also perform their jobs more effectively. Having a personalised user profile will also strengthen the internal company brand as it becomes your own personal company intranet homepage rather than just the company's intranet homepage. Just like social networking profiles have a 'friends' box, having a 'colleagues' box on a work profile provides a useful overview of your colleagues. This is especially useful for people who have to manage several projects or who need to be in touch with various team members. They just need to check their people links and contact them with regards to the project. Projects that aren't big enough to warrant a full wiki but require some sort of collaboration documentation can be put on to the intranet. Like a wiki, online collaborative documents can be via invitation only or can be open to anyone to edit. As mentioned in the wiki topic, wikis are a useful tool when it comes to collaboration. Wikis are easy to edit and require only a web browser. Different levels of access can also be granted so a wiki can be made private or available for everyone on the intranet to view. Information that is private will remain private. Having a blog and RSS feeds where new changes are listed automatically for everyone to see is another invaluable tool for project work on the intranet. In a wiki such as this one, there is actually a page rating system available for people to rate pages. This provides a useful indicator of what pages are working and aren't working. Being able to leave comments on pages would be useful as well. Instant messaging and Voice Over Internet Protocol (VOIP) is one of the ones in which people can communicate. Instead of having to spend money maintaining phone conference rooms, having an instant messaging system coupled with a VOIP system can be a cost effective method to reducing international and national telephone bills. A useful feature of Microsoft Outlook and social networking profiles has been the calender planning feature allowing people to organise meetings and send invitations. Having such a feature on the intranet alongside a wiki would be a very useful for people needing to organise projects and meetings with others. Even though the intranet is much smaller than the internet, trying to find relevant information can sometimes be a chore. A customisable profile, search tags and weighted searches, can be used to ensure that when someone searches for something, information relevant to their job appears. 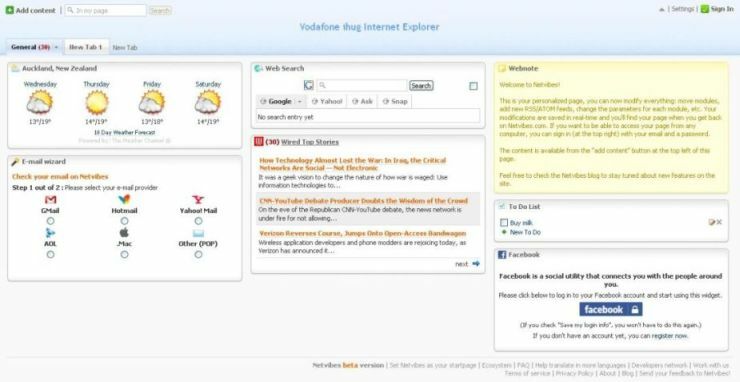 For example, if a sales person searches using the term 'information' on the intranet, product information on Vodafone's latest mobile internet would be shown. If a computer technician searches for 'information' on the intranet, the Vodafone intranet would bring up links to the latest changes to the Vodafone website and any new internet tools implemented. Widgets are the mini-applications that increase the functionality of a profile. The platform should be robust enough to handle mini-applications to be attached to the intranet profile and the ability to program in more as necessary. This will go a long way in ensuring the intranet can easily evolve without additional network strain. Featured in Time Magazine's 50 Best Websites (of) 2007. Netvibes allows you to check a variety of e-mails and log in to your facebook all from one homepage. Integrated with the google search engine, iGoogle is gaining popularity as more and more people switch to gmail. Like any new technology there are always barriers to adoption and advantages and disadvantages to it's adoption. A huge overhaul of the internet system would be require in order to implement a smarter intranet. Aside from the the technical barriers, there are a number of design and social barriers to embracing a new intranet. The layout of the windows and buttons on the intranet is one of the most important aspects of intranet. Usually, less is more when it comes to the layout of an intranet page. Each button or window should have a meaning and purpose. Being able to customise and save your own layout is also very useful. Very often, companies believe having more features is better. However, the problem with large intranets is precisely too much information and features. A default user profile should start with essential features and allow users to add features relevant to their job or remove them if they become unessential. A balance must be struck between the design team and management over the intranet. Not everything needs to be management approved and similarly the design team shouldn't be allowed to 'go completely crazy' over the intranet design. The goals of the intranet redesign should be made clear and followed although there should be allowances and room for creativity. Having proper support by management can be an important factor in adoption of something as radical as a wiki. More than that, management should utilise it themselves as an example to show how useful it is. Using and managing pages on a wiki or blog is very different from simply typing in a document and sending it to everyone. There are plenty of useful tools on a wiki but training is required to bring people's attention to them rather than having to stumble through using a wiki and discover them by chance. All these new features are great tools to be used, but if no one's excited by the new possibilities these tools open up, then the effort gone into creating them is wasted. Some may argue there can be a lack of measurable outcomes when it comes to implementing new intranet features. However, the intranet is like the company e-mail system and company newsletter. It's hard to put a figure on how much money all these make. Similarly, it's hard to imagine the monetary benefits of implementing for example, a page rating system yet it can be a valuable way to ensure the intranet is alive and performing the way it should be. Having blogs and wikis can be a good way to communicate with others within the company however, there are potential issues of abuse as employees spend more time socialising than working or posting inappropriate things. Just like there is an official e-mail policy an interactive intranet should have policies managing what is placed on the internet and there should be a set number of policies on what should be placed on the intranet what it should be used for. These policies should be gone over and readily available to everyone. Sometimes there are too many administrative and bureaucratic barriers to self-publishing on the intranet which can sometimes hinder the intranet. Very often, important information that needs to be released and updated requires approval by various people before being published. This can slow things down and create a back log. Corporate politics can be a large stumbling block to creating a new system or changing existing things. Politics should be kept to a minimum to ensure delivery of a better intranet. Simply Communicate - On why social media is hard to implement in companies. Intranet Journal - On the top 10 Intranet Mistakes. Here are a number of solutions to assist in the adoption of an improved intranet. Identify what needs to be fixed and where the intranet will be in several years time. There are plenty of things that could be improved, but it's important to focus on the key improvements and make sure those work before focusing on the fine-tuning. Identify a project or group that could really benefit from the adoption of a new technology and give them the technology to test it's effectiveness. This report is perfect example of good wiki use. A wiki may not be suitable for all projects but for this role, it is precisely what was needed. Just like social networking profiles, the more people adopt an application the easier it is for other people to join it. Similarly, adopting new features on the intranet should be done through 'viral marketing'. If employees get excited over it, it makes other employees want to use it. As easy as say wikis or blogs are to use, training will serve to not only help people use the technology but also show that management endorses and encourages the use of the new tools. The intranet policies can also be reviewed during this time and gone over so people know what is acceptable and what is not. Very often, companies believe the IT department should be handling everything to do with the intranet when they are technicians not designers. The intranet should be something that continually evolves to better serve the needs of the employees. It's important therefore, that various departments frequently discuss issues with the design of the intranet and advise on what works for them and what doesn't. As employees are the users of the intranet, it's important the employees get a say as well not just the department heads. After all they are the ones who have to use the intranet. Very often the younger employees are the ones who are using newer technology such as RSS and wikis and their input can be particularly valuable. Prescient Digital - On social media adoption in the business and planning for the incorporation of social media on the intranet. Jakob Nielsen - On intranet usability. Jeff Veen On a case study on intranets and internal departments. Intranets are an important company resource that provide information news and support to employees. A number of key ideas from things such as social networking profiles and wikis can be used and applied to the intranet to improve it. These ideas include customisability, the ability to subscribe and ease of collaboration. Features that should be implemented include a smarter user profile, RSS feeds and wikis. As with any project, there are a number of design and social barriers preventing the intranet from being improved such as having too many features and department politics. To reduce the barriers and potential problems, Vodafone should remain focused on delivering a smarter intranet and involve its employees in the intranet making process.